Pentatonix has sold nearly 10 million albums in worldwide consumption and performed for hundreds of thousands of fans at their sold out shows across the globe. Their YouTube channel boasts more than 15.5 million subscribers, yielding over 3.4 billion video views. Their 2015 self-titled album is certified gold after debuting #1 on Billboard’s 200. Additionally, nine of their albums reached the top 10 on Billboard’s 200 chart (two albums reaching #1) and received multiple RIAA certifications for multi-platinum, platinum and gold selling albums and singles. Rachel Platten is an Emmy Award winner, multi platinum selling recording artist. Few artists in the past decade have struck a chord of hope and resilience like she did with her empowering hit “Fight Song.” Listeners instantly adopted the transformative anthem as their own, linking fans’ tales of personal empowerment across the globe. Rachel topped countless radio and iTunes charts worldwide, with her major label debut album “Wildfire” which also included the platinum Billboard Hot 100 hit, “Stand By You.”Most recently, while awaiting the arrival of Rachel’s precious baby girl, she released “You Belong” as a dedication and anthem for expectant moms everywhere. Tickets will be available to the general public starting Friday, February 15th at 12pm local time at www.ptxofficial.com. 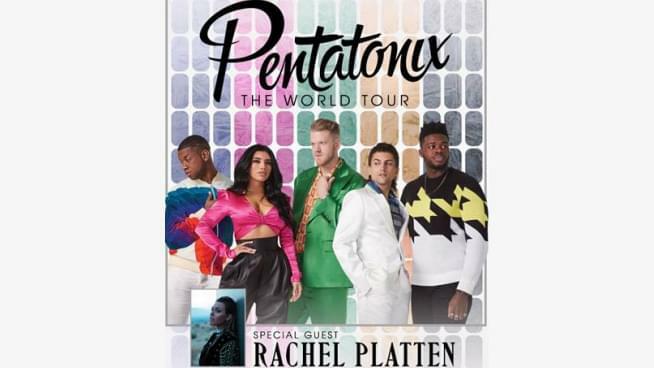 Pentatonix and Rachel Platten will be coming to the Starlight Theatre in Kansas City! Don’t miss your chance to see them live!